Ti Atis (Little Artists) is an in-school arts education program engaging youth of Haitian descent and their peers with Haitian history and heritage via the arts. The program gives young people ages 6-14 the tools to build an inclusive and culturally informed future as they learn about diverse art forms from professional Haitian artists. Our Youth Cultural Engagement programming consists of school-based and public offerings that increase appreciation of Haiti and its culture, promote positive cultural identity and self-image, facilitate cross-cultural dialogue, and cultivate an inclusive sense of community amongst young people. This year, in partnership with Haitian Americans United for Progress (HAUP), HCX invited three artists to each create a 10-week arts residency which resulted in the following workshops: Creative Expression Through Movement with Maxine Montilus, Discovering the Music of the African Diaspora with Okai Fleurimont, and Community Mural Creation with Patrick Icart Pierre. Over 60 students participated in these various workshops and were able to explore certain aspects of Haitian & Afro Diaspora culture while expressing their creativity through movement, painting, dance and music. 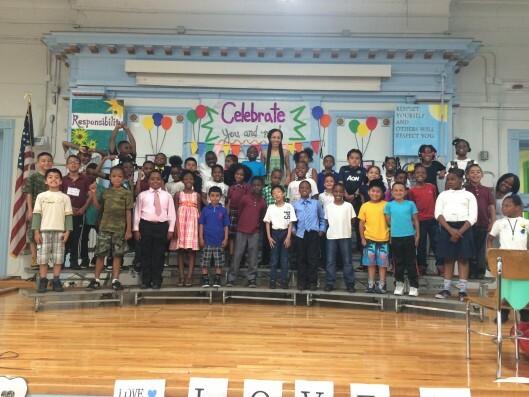 Thanks to funding from Council Member Jumaane Williams administered by the NYC Department of Cultural Affairs, we were able to expand our Ti Atis program to P.S. 361 in East Flatbush, Brooklyn. From April 14th – June 16th 2015, HCX implemented a 10-week pilot of Ti Atis programming at P.S. 361. The project was split into two sessions, Haitian Folkloric Dance/Movement and Storytelling and Songs of the Caribbean, and were taught to two separate assembly groups of second grade students for five weeks each. Both sessions were led by Riva Nyri Précil, a singer and dancer of Haitian descent who holds a Bachelors Degree in Music Therapy. Drummer Jean Marie Brignol assisted instruction of the Dance/Movement assemblies. Additionally, we organized a number of workshops and assemblies in schools including at the Hewitt School with drummer Okai Fleurimont and Westbury Middle School with dancer Peniel Guerrier and his troupe. We thank all of our Teaching Artists for their time and dedication. Make a DONATION to our Youth Cultural Engagement programs and support the preservation of Haitian Culture & Heritage! From October 7th to December 10th, HCX invited dancer Maxine Montilus to create a 10-week afterschool program at P.S. 189. With a B.F.A. in Modern Dance Performance from the University of the Arts, and an M.A. in Arts Management from City University London, her students had the opportunity to express themselves through the exploration of dance and written word. Through improvisational theater games, movement, and writing activities, students learned how to integrate choreography and poems/writings into a multi-disciplinary performance incorporating words, music and dance. Some topics that were explored included identity, favorite things, and family. From January 10th to March 18th, HCX invited musician Okai Fleurimont to create a 10-week afterschool program at P.S. 189. Okai has worked with many different community based organizations such as Hospital Audience Incorporate (HAI), WorldUp.org, and Hip Hop Saves Lives, teaching children how to write lyrics, produce a beat, and provides opportunities for youth to share their ideas and foster their creative development. Students were taught how to play percussion instruments and given an introduction to the different African diaspora musical genres, learning the different rhythms and breaks and discovering how in depth music goes. By giving students the knowledge of the history and struggle that influenced certain periods of time helps them better understand the music they listen to now. From March 20th to June 27th, HCX was happy to invite back Patrick Icart Pierre for a 10-week after school mural project at P.S. 189. Pierre has worked as an art teacher at the Harlem School of The Arts and currently works at M.S. 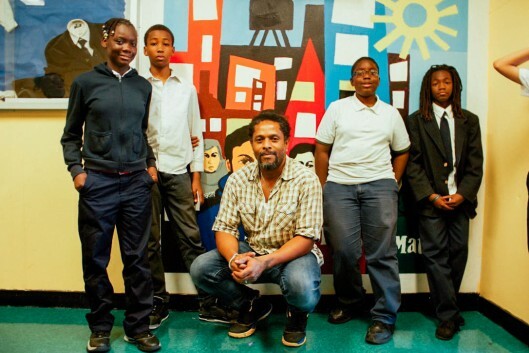 246 in Brooklyn New York, instilling his appreciation for art in the public school system. With the belief that murals give voice and presence to those communities and historical events often excluded in our society – women, people of color, gender issues, working class people, freedom fighters, etc. – participating students got a chance to understand that creating art is a way to go beyond the textbook and encourage everyone to get out into the community. 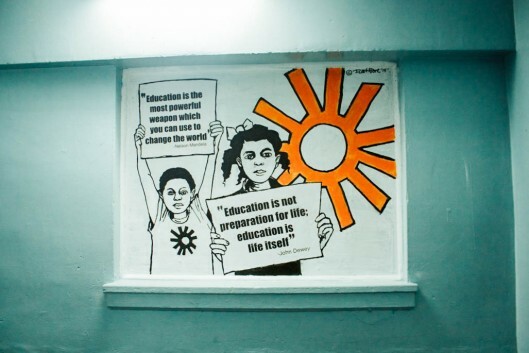 The completed mural incorporated local concerns, oral histories and photos, and other references, accessing the richness and wisdom of their communities, and students’ families. From April 14th to June 16th, HCX invited musician Riva Nyri Précil for a 10-week, two session program for 2nd grade students at P.S. 361. With a degree in Music Therapy at Loyola University in New Orleans, and a completed Music Therapy internship at Beth Israel Medical Center in Manhattan, she has had the opportunity to teach music, art and movement to a wide variety of populations in diverse settings. Focusing on exposing Second Grade students to traditional Haitian folkloric dance, Précil provided an introduction to Haiti’s oral history through storytelling and folk songs. With the first five weeks focusing on Haitian folkloric dance and movement, students had the opportunity to learn basic dance elements with an invitation to participate in a short performance. The last five weeks focused on storytelling & songs of the Caribbean, students learned traditional songs and learned lessons through stories that include a moral. Students were also invited to participate in a short performance. Bèl Bagay Lakay will take place on July 11 and 12, 2015 in downtown Farmington, Michigan. This 2-day outdoor event is an opportunity to give the Farmington and Metro Detroit residents an opportunity to sample and experience the uniqueness of the Haitian culture through its art. HNGD is seeking artists and artisans to present their work in various media, including oil painting, fiber, wood, photography, etc. Sponsorship opportunity is available for a limited number of exhibitors and will be awarded on a first come first served basis. Although there is a very strong Haitian and Caribbean presence in Farmington and the neighboring cities, this event will not solely focus on catering to these groups. HNGD plans to take full advantage of the media to attract individuals from across the Metro Detroit area. The announcement about Bèl Bagay Lakay has been favorably received by the Farmington City Council. Additionally, an article written in local paper, the Farmington Observer has generated a lot of buzz within that community. For more information about the Haitian Network Group of Detroit, please see our website: http://haitiannetworkdetroit.org or call 248-231-5767. The HCX community came to dance to the infectious beats of Dj Sabine Blaizin on Sunday, May 17th, 2015. Celebrating the creation of the bicolor to the riveting sounds of drums, HCX held its second annual Flag Day at Parkside Plaza in Brooklyn. In partnership with the Arts & Culture Fest, the all day outdoor festival attracted an array of vendors ranging from local Haitian and Afro-Diaspora artists and artisans to “bon manje lakay” (great Haitian food). 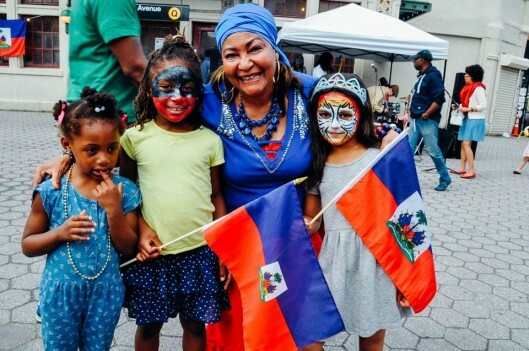 The event was filled with activities (face painting, arts and crafts for kids, live drumming) and the unshakable spirit of the Haitian presence. Performances by Jocelyne Dorismé and Smax Music resonated throughout the plaza while the crowd grew as the day progressed. Dancing and more dancing in accordance to the Haitian genome. Later in the afternoon, a number of political figures showed their patronage to the organization and addressed the crowd, expressing how much the Haitian and Afro Diaspora continue to enhance the already vibrant community of Brooklyn: Assembly Member Rodneyse Bichotte, and Council Member Jumaane Williams, to name a few. Traditional Haitian vodou songs sung by the soulful, soothing voice of Riva Precil contrasted by Monvelyno’s sharp electric guitar and the rumbling of percussions filled the air as the festival came to a close. After a great day of prideful festivities and invigorating vibrations, we’d like to thank all that came to celebrate with us. HCX continues to keep the Haitian culture moving and plans to bring you the best Haiti has to put forward. Diaspora Community Services, Council Member Jumaane Williams, the Embassy of Haiti, the NYC Department of Cultural Affairs in partnership with the City Council. Sunday, May 17th | Haitian Flag Day Selebrasyon! 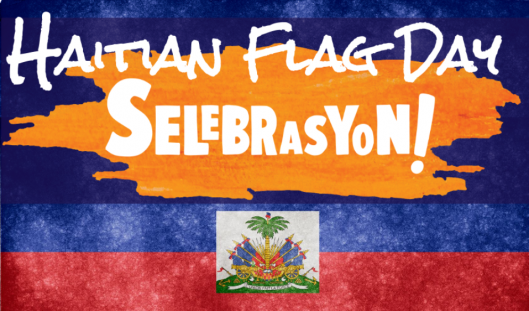 HCX invites you to Haitian Flag Day Selebrasyon! May 18th is the day Haitians dedicate to celebrating the creation of the flag, sewn by Catherine Flon in 1803. Communities in Haiti and throughout the Diaspora come together in prideful celebration! On Sunday, May 17th HCX invites you to join us for our second annual Haitian Flag Day Selebrasyon! In partnership with the Arts & Culture Fest, this all day outdoor festival will take place at Parkside Plaza on Parkside and Ocean Avenues in Brooklyn. Shop for one-of-a-kind gifts and support local artists at our marketplace featuring Haitian and Afro-Diaspora artisans and local businesses. With free outdoor activities including a DJ, live drumming, musical performances, food, dance workshops and FREE face painting and arts & crafts for kids. Located at one of Brooklyn’s most travelled crossroads, we expect to attract over 1,000 people. Confirmed participants include DJ Sabine Blaizin, Assembly Member Rodneyse Bichotte, and Council Member Jumaane Williams. Haitian Flag Day Selebrasyon! vendor. Haitian Flag Day Selebrasyon! volunteer. Our 2015 Flag Day Selebrasyon! is supported by Diaspora Community Services, Council Member Jumaane Williams, and by Public Funds from the NYC Department of Cultural Affairs in Partnership with the City Council. Last year’s Haitian Flag Day Selebrasyon! was a blast! Jocelyne Dorismé and Nadïne LaFond got the crowd moving and children from the P.S. 189 Dance Ensemble showed off their new dance moves! Take a look at last year’s event by clicking here!